[by Dean Smith] An archaeological discovery in 1993 was the first historical reference to King David found outside the Bible. And it was an odd reference. The discovery was made by archaeologist Avraham Biran at Tel Dan located in Northern Israel. The inscription was found on a stela dated to the 9th century BC. A stela is a stone slab that would have been installed publicly as a monument usually to commemorate a major event. What was odd is that the stela was not written by the Israelis themselves, but by their enemy. 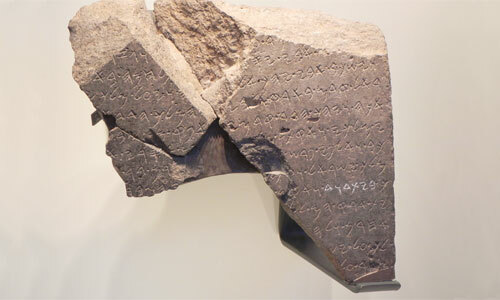 The stone, which was only partially intact, was commemorating the victory of an unnamed Aramean king over “The king of Israel” and the “king of the House of David” — a reference to the nation of Judah. Neither of the three kings involved are named, though their names may have been referenced on parts of the slab that were broken off. On the stela, the Aramean king brags that his god Hadad helped defeat thousands of soldiers and charioteers from the armies of Israel and Judah. The Bible does reference an Aramean king who defeated both Israel and Judah in battle — King Hazael. There is almost unanimous agreement the stela was written about Hazael’s victory over King Jehoram of Israel (also known as Joram) and King Ahaziah of Judah at the battle of Ramoth-Gilead (2 Kings 8:28-29; 9:14-15). Ramoth-Gilead, which was under the control of Arameans (also known as Syrians), was formerly a city of refuge in Israel bordering Syria. The city was the site of many battles between the two nations because it was a key strategic point. Jehoram convinced his nephew King Ahaziah of Judah to join the battle to retake the city, but Hazael soundly defeated them. But there are a couple of typographical errors on the stela. First, it was actually Jehovah who helped this Aramean king in this victory, not Hadad — a Syrian rain-god, that similar to Baal was portrayed by a bull. Secondly, the stela boasts the Aramean king killed both opposing kings in battle. Though Hazael played a key role, he did not deal the last blow for either king — call it propaganda license. According to the Biblical record, Jehoram was wounded in the battle and forced to withdraw. While he was healing from his wounds, his general, Jehu, assassinated Jehoram taking the throne (2 Kings 9:16-26). Jehoram was the son of King Ahab and one of the most wicked queens in Israel’s history — Jezebel. Ahaziah was a grandson of this notorious couple. Prior to this battle, the prophet Elijah who God raised up to fight Jezebel had gone to Damascus and prophesied that Hazael would overthrow the current ruler of Syria (Benhadad) and God would use Hazael to rid Israel of Jezebel and her Baal worship (1 Kings 19:15-18). Around the same time, Elijah also anointed Jehu, who was then just a general in the Israelis army, as the next King of Israel. With Jehoram’s death, Jehu then killed King Ahaziah (2 Kings 9:27) and finally Queen Jezebel (2 Kings 9:30-33). Jezebel’s wicked influence in Israel was finally ended and Israel’s kingly dynasty reverted to Jehu’s family who was officially anointed king of Israel (2 Kings 9:1-10). So it was ironic that the monument commemorating King Hazael’s victory was equally a commemoration for Israel celebrating the end of Jezebel’s evil influence in Israel and Judah. But it would only be a temporary respite, as the book of Revelation records the evil spirit behind Jezebel’s wicked rise to power would raise its head again and attack the church during the end times. Love it! G-d is so faithful to reinforce the most basic truths in ways we can understand!